Place the sock on your working area like this: Cut a straight line through the length of the toe area. This will be the puppet's mouth. Open the mouth you have just cut and place it, opened wide on the felt. Be sure the edges of the felt overlap the total space of the mouth. Mark and cut the felt so that you will have a piece that fits into the mouth. Sew it there. Cut two pieces of cardboard; one that fits into the upper mouth space and one that fits into the lower mouth space. Glue the two cardboard pieces inside of the puppet's mouth on the felt. Stuff the puppet's snout and face with the acrylic stuffing. The puppeteer's fingers should fit snuggly between the stuffing and the cardboard. 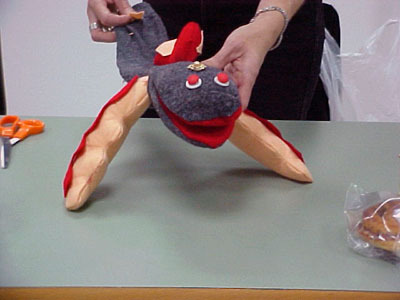 The sock puppet has a moveable mouth, making it suitable for verbal communication. After creating the puppet, the puppeteer should begin the process of personification, discovering whom the puppet is and what it wants to say. Puppet manipulation is how the puppet can say what it wants to say.